3:37 P.M. UPDATE: The Atlanta Journal Constitution is reporting that Eliyshuwa Yisrael and two other purported “sovereign citizens” were acquitted today. 3:49 P.M. UPDATE: WSBTV.com also is reporting today’s acquittal. Our earlier story is below . . . In some areas of the United States, including Greater Atlanta, purported “sovereign citizens” allegedly have engaged in deed swindles and have become squatters in properties they don’t own. 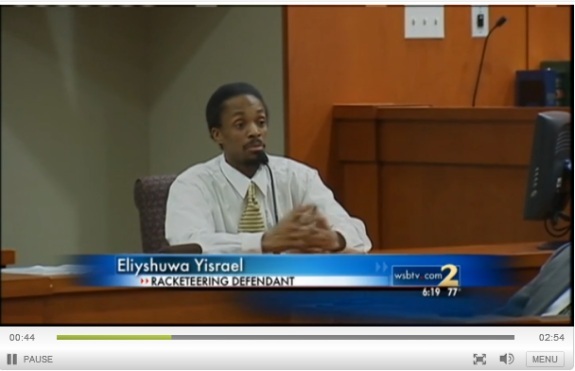 Action News 2 (WSBTV.com) is reporting that purported “sovereign citizen” Eliyshuwa Yisrael claims he created no victims when he allegedly took possession of a $13 million shopping mall. A family that placed the ad wanted to give away items outside, the station reported. But the wording of the ad apparently triggered confusion, and people broke into the home before the giveaway started and removed clothes, shoes and family keepsakes. Oh, there definitely are victims… the banks, but the public is not in a good mood with banks. Try that on a small investor who had just BOUGHT the home from the bank, and these folks won’t be so lucky. They picked REO properties specifically for this reason, likely. Quick note: A would-be poster (now blocked) submitted a threat to this thread at 5 p.m. yesterday.